Stranded in the war torn Pacific, Patrick and his younger brother Teddy are finally homeward-bound. They've stowed away on one of the US Navy's finest ships, and now they just need to stay hidden. But Japanese torpedoes rip their dream apart. How might the story be different if it happened somewhere else (or in a different time period)? 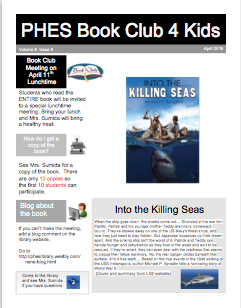 All students who leave a message will be invited to a special luncheon in the library to discuss the book on April 11th. See Mrs. Sumida for a copy of the book.